iTablet Coming Soon; Lawsuit to Follow? 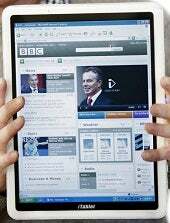 A UK computing firm announced that it will add yet another device to the fast-growing tablet space. However, the choice of name is sure to raise a few eyebrows, particularly Apple's. The British-based X2 Computing, which has a history in mobile devices, revealed that its upcoming product will be known as the iTablet. The iTablet name was one of several names rumored for Apple's recently revealed iPad, along with other suggestions such as iTouch and iSlate. So it's of interest that X2 Computing boldly decided to go ahead with the somewhat risky name, especially considering Apple's fierce take on trademarks and the 'i' branding. However, despite Apple's possible future objections, it does not hold the iTablet name in the US. Taiwanese company AMteK is the current owner of the iTablet trademark in America. Beyond the possibly dangerous name choice, what does the upcoming iTablet offer? According to Pocket-Lint the new tablet will house a 1.6GHz Intel processor, up to 250GB of hard drive space, and HDMI output, in addition to three USB ports, built-in Wi-Fi and Bluetooth, and 3G capabilities. Unlike the iPad, the iTablet will not only support Flash but will also include a built-in 1.3-megapixel webcam. X2 will offer the iTablet in a wide range of case colors, and it comes with either a 10.2-inch or 12.1-inch widescreen TFT screen. It can also run either Windows or Linux. X2 computing has not yet announced pricing, but the company did say that the iTablet will ship this April. Whether the firm can sell the tablet in the US remains to be seen due to the aforementioned trademark issues. Place your bets in the comments on how long it will take before a lawsuit crops up.